Need an electrician in Maddington? Here at Holdens Electrical Contracting we understand how important it is to use high quality, experienced tradespeople. Electricity surrounds us, and if used in the wrong way, it can become extremely dangerous. This is why you should always use a qualified electrician for any electrical work in or around Maddington. Our industry leading team of highly-trained professionals is equipped with the skills to perform any electrical task, from maintenance to installations and upgrades. We have the skills and know-how to work on any job, no matter how big or how small. 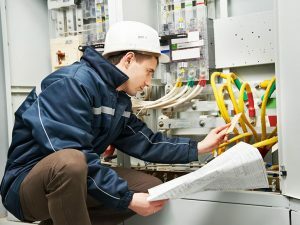 It doesn’t matter if you’re looking for domestic, commercial, or even large-scale industrial electrical work – we can help! At Holdens Electrical we take pride in our reputation. We are always striving to become a better business and to provide better service to you, our clients, and we believe that this has placed us among the leading Maddington electricians. If you’re looking for high-quality work that is finished above and beyond industry standards – but don’t want to pay a fortune for it – then get in touch with us today! We employ only the best electricians that Perth has to offer. Every single one of our team members is trained in customer service and safety along with their obvious electrical skills. This means that they all understand the importance of doing what they can to meet your needs, and their work reflects this. Our prices are extremely competitive, which means that you get more, but pay less. Our services are accessible to anyone. Our experienced electrical contractors have the training and know-how to develop solutions to any electrical problems, allowing you to rest easy with the knowledge that we will get the job done – no matter how hard it seems! We offer a huge range of services. If it’s even remotely related to electricity and electrical work, we do it! Reach out to our friendly customer service team by phone or email today to find out more! Really, no job is too big or too small for our team. We use electricians who are experienced an able to do everything from installing a new powerpoint to wiring an entire industrial site. Commercial Electrical – We have the experience and know how to provide electrical solutions to a wide range of businesses. We offer 24/7 service to make sure that your electrical network remains in working order. If you do experience a fault, we will be on the job as soon as possible the amount of potentially costly downtime you have to suffer. Domestic Electrical – If you need electrical work done on or around your home, then we’re the people to call. Our residential electrical services start with simple repairs and modifications, but we can also install new lights or circuits. We can even rewire entire buildings if you need us to! Industrial Electrical – Here at Holdens Electrical we understand that industrial sites can be extremely taxing on electrical networks. Wear and tear is common, and regular maintenance checks are essential. Get in touch with us to arrange a full electrical inspection of your industrial site. If you’re serious about employing a top-quality, affordable electrician to complete your Maddington electrical work, then get in touch with us today. One of our friendly team members will be happy to answer any questions that you might have, and together we can come up with an action plan to solve your electrical problems. Call or email now!